Following our recent interview with Dave Gahan, we present a special interview with Depeche Mode’s songwriter Martin Lee Gore, originally published in German ten years ago in 2003—on the occasion of his solo album Counterfeit²—for Alert Magazine and conducted by our editor-in-chief Max Dax. It’s reproduced here in English for the very first time. Martin, do you like America? Do you like country music? I love Willy Nelson. Why do you ask? Because when it comes to Depeche Mode, everybody thinks of electro pop. Or concerts in sold-out stadiums. Or Dave Gahan’s drug career. But you recorded cover versions of traditional American country ballads on your second solo album Counterfeit². That’s true. The opening song is an old blues tune called “In My Time of Dying”, and it blew my mind a while ago when I listened to Bob Dylan’s debut album that was released some four decades ago. I listened to it on vinyl of course, and realized that this song was a cover version, too. It wasn’t penned by him; Dylan only rearranged the song. Especially if you take into consideration how he sings the song. So, I liked the song and the mood of it, and I started to search for the original version. I finally found a version by Josh White on a gramophone record from the 1930s. But this again only was an interpretation as “In My Time of Dying” is a traditional tune. I continued to search for even older versions and finally got hold of a rendition by Blind Willie Johnson—again a recording from the ’30s. In all three different versions, the melody was almost similar-sounding and the lyrics varied only here and there. But the structure of the song was always the same. I wondered why the lyrics of these old songs never seem to be identical, but I soon found out that this is part of the American oral tradition of passing on songs from one traveling singer to another. One singer would leave out a line or invent a new one while keeping the structure of a song intact. I understand the American song culture as such an oral culture. You also recorded a second ballad from the same period. That one is called “I Cast a Lonesome Shadow”. It’s a song by Hank Thompson. That’s a real country outlaw ballad. Everything is perfect. But it isn’t a traditional. Thompson wrote it in the 1950s. The beautiful thing about these old tunes is that they rank around old myths and legends. They are like alternative history lessons. Greil Marcus called these songs messages from the old, weird America. I was less impressed by this theory of the old, weird America. I simply felt drawn to the sad stories that don’t have a happy ending. I never liked the idea of writing happy songs myself either. Happy go lucky songs don’t have the power to reach and touch you deep inside. They won’t stick. I feel closer to the universe writing or singing songs that deal with solitude or melancholy. Do you think it’s a sign of quality if a song is written in minor chords? If I write a song, most of the chords—but of course not all of them—are minor chords. Then again, I don’t start writing a song with the intention to be a sad one. It just happens, you know? Many people have told me that the songs that I covered on my new record feature the same topics like songs I write for Depeche. I guess that this is not a coincidence. I probably just feel like walking on safe territory. I just like that kind of music. Aren’t you annoyed by the fact that every kind of solitude and melancholy has already been articulated? Maybe? Most of the songs I write for Depeche deal with various aggregate statuses of relationships. These are good songs because they always have a twist—an unexpected ending or shift. That marks the difference compared to other pop songs. But I admit it can get difficult when people start to expect a certain kind of song from you. So, I guess that’s what you call craftsmanship when it comes to songwriting: How can you write something that is truly you without becoming formulaic? That’s probably one of the main reasons we always pause for so long between Depeche Mode album releases. Are you saying that you have to live through certain things—be it relationships—to be able to write about them? I mean, it’s basically you who writes the songs for Depeche Mode, and not Dave Gahan (who is singing your songs). I can only speak for myself, but it certainly is difficult for me to write under pressure. That’s why it always takes three or four years to write and record a new album. Back in the days when we basically had started the band, everything in hindsight seemed so much easier. Maybe it’s because everything you go through when you are young is genuinely new. When you grow older, you go through the same things again. It’s a big difference if you write about something new or something you happen to see again. It could also be that the brain is computing faster when you are younger, who knows? Finally, something I’d call quality control didn’t play any role when we started. We just banged out our stuff. Today we think about it so much more. I wouldn’t feel comfortable to think about releasing records in the same insane speed like we used to. Your connection to Germany seems to be a continuum through the decades. You learned German as a foreign language when you were a student, you recorded a couple of Depeche albums in Germany, and you even covered Nico’s “Lied vom einsamen Mädchen” in German. Do you like its slippery grey skies? I’d say it was a lucky coincidence that I chose German as foreign language in school—and not, say, Spanish or French. West Germany clearly was the country I felt primarily drawn to. For most of my pals though, Germany remained strange because they couldn’t understand the language. In 1984 I even moved to Berlin for a couple of years. And of course, this stay did form me. I had a German girlfriend for five years. Things like that impress you, and they substantiate feelings that you can have towards a country. And for sure I was always interested in certain German music—namely Kurt Weill. If I had to pick one song that I really love, it probably would be “Lost in the Stars” by Weill. That’s also the song on your album that comes closest to the original. You almost didn’t touch the arrangement. Did you show too much respect? You are right and you are not. I mean, how could I have approached the song differently? The song is perfect. It was the first song of the album that I was certain to include. From day one. All the other songs I interpreted far more radically. And then again: Kurt Weill didn’t record “Lost in the Stars” in an electroacoustic version. But his music and his chord progressions are so unique that leaving out a single note would create a gap. It’s totally different with John Lennon’s songs. I could reduce “Oh My Love” to a fraction of the original chords and it was still the song. You like collaborating with German avant-garde producers when it comes to commissioning remixes. Don’t you know Stefan Betke of Pole fame? Stefan is a very kind guy. I once met him after a Depeche show in Berlin. I love Pole. Another German musician I really like is Uwe Schmidt aka Atom Heart. He did a remix of my version of “Stardust”. Do you also follow other German musicians such as Coloma or Kreidler who tend to blend song and abstraction? Of course I check out the German stuff that is being published. But not only. I also listen to music from other countries. I am totally into new music. I constantly buy new records, especially contemporary electronic music, underground electronica, minimal house, clicks’n’cuts. Stuff like that. It’s not my fault that the field of electronic music lately split up into so many different fractions. You recently even started a career as a DJ. Oh yeah. I started it for fun and it has become a real habit. You know, I started off in a very small bar in Santa Barbara where I live. The bar belongs to a friend of mine, that’s why. On a really good day I spin records in front of maybe a hundred people. On bad days I play to a dozen guests—and some of them are even playing snooker in the backroom. They are not even listening to what I am doing, but that’s alright. For me, something else matters: I really listen to the music I am spinning. I’d call it conscious listening. Even if I’m just packing my bag, selecting the records that I want to play, I hear the music in my head. I haven’t DJ’d often recently. But that doesn’t keep me from constantly buying records via the internet. It’s a pleasure to spin records in a real club as you sometimes only hear the bass when you play it loud. Andrew Fletcher has also started to spin records. He was recently in Cologne. Andreas Reihse from Kreidler was there. Ah, Kreidler. I sometimes play some of their tunes as well. He told me that it must have been quite a surreal situation as the promoters tried everything to keep the event low-key. I understand. They wanted to avoid too many Depeche fans showing up? It’s strange sometimes. In Santa Barbara nobody has to keep anything secret at all. They don’t seem to care that much. Which is a good thing, as I prefer the Californian sun to the grey Cologne skies. When Depeche Mode recorded the album Songs of Faith and Devotion in 1992 in Hamburg, you went clubbing and visited the Mojo Club on Reeperbahn. The day after all the newspapers printed their ‘exclusive’ story about that night out. That was fun, I agree. It was the same in West Berlin, by the way, when the city was still surrounded by the wall. But you know why we chose to record in cities like Hamburg or West Berlin? Because these were exotic cities to us. I still remember how we’d hang around in London and ask ourselves where to record the next album. Somebody would say “Berlin” and we all immediately liked the idea. We liked Berlin because cool bands like Einstürzende Neubauten lived there. Not least Gareth Jones used to live in Berlin—he was our producer. He’d say, “What about the Hansa studio at the Berlin wall?” And we all just agreed. We found it exciting. We actually wanted to undergo an adventure and Berlin just promised that to us. So there we went and we did indeed record Construction Time Again at Hansa studios. It was a pretty awesome time. So why not record the next and the following album there as well? During that time we decided to always fathom a period of recording in any given city as an adventure trip. And that’s what we did when we recorded in Spain, in Italy—and in Hamburg. And there you went into the Mojo Club and everybody was staring at you. Isn’t this annoying? Honestly, this only happens to us in Germany. We call it the Michael Jackson syndrome and we only experience it here. It doesn’t happen to me in Santa Barbara, anyways. I live quite an anonymous life there. People who are way more famous than myself live in Santa Barbara. I recently watched this TV special about Michael Jackson. And I can assure you that I felt for him. This guy can’t take a walk anywhere on this planet without provoking immense reactions from the people around him. And the best thing is, the same people criticize him for not being “normal”. Does it help to always travel as a group of at least three or four men when you are on tour or recording? Not only Depeche Mode, but also other bands before you have created this image of an outlaw gang from a Western movie. Beards grow, hats are bought, suddenly even tattoos are being displayed. 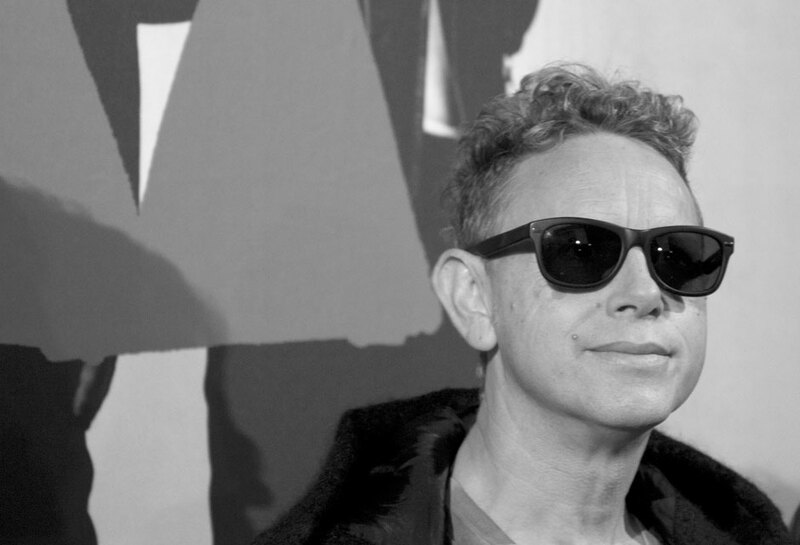 Is Depeche Mode a band that is held together by a gang mentality? Absolutely. And I am not only talking about touring when we emphasize all that in our shows. It also goes for all the trips to America or Europe when we had to just do a TV show. Especially when it comes to TV, we felt pity for all the solo artists who were featured in the show as well. They hung around in their dressing rooms all alone or, in the best case, together with their personal assistant. These people live a life in solitude. Actually, at the moment I am experiencing this life too, as I am promoting my solo album. I am traveling only with my manager. I am missing the feeling of being part of Depeche Mode. Suddenly I have become one of the ones I used to feel pity for—because they always disappeared from the set of the TV shows without a trace, whereas we as a group of guys would discuss which club we’d like to spend the night. We were a gang in the true sense of the word. Like in a Western movie, it starts with your body language and ends with the amounts of alcohol you drink. Back then, Dave still drank and even Alan Wilder was still part of the gang. You have probably noticed that in good Western movies all the protagonists drink their whisky from bottles that have no labels—and they start at noon. We were a gang of four and we felt invulnerable. We’d land at an airport and would already feel that we’d taken over the city for this one day. That was something. It was a great feeling. After our shows or on days off we’d go to clubs, us, the gang of four, well-dressed. We always felt like we were entering the saloons of some remote frontier towns. And then we’d start to drink. We always had great nights out because we never felt lonely, even if we were in environments we’ve never been before. All this doesn’t happen anymore. This has, of course, to do with the fact that Dave doesn’t drink anymore and that Alan has left the band. A trio simply ain’t a quartet—no matter how you look at it. But then again, we again follow the narration of the Western movies where the bad gang always gets decimated during the film. In other words, only you and Andrew Fletcher have survived. Two’s not a gang. That’s true, but we now have a drummer, a keyboard player and even background singers. The way you tell the story is very entertaining. But Dave Gahan almost became a deadly victim of this lifestyle. He overdosed in 1996 in Los Angeles. How did this moment change your life and the way you look at your past with Depeche Mode? For all of us this has been a very tough time. Especially as we didn’t know how to communicate with Dave anymore. I mean, Dave is a difficult personality, no matter how you look at it. And we all knew that he had serious drug problems. But you can’t really help a person if he doesn’t want to be helped. When it happened I started to also look at my own life with different eyes. I can only say that I was lucky that I was never drawn into such a mess. In that sense I’ve never been in a situation that constrained me to radically change any of my habits. In the film The Last Waltz, Robbie Robertson famously states, “You can’t live the life on the road forever—sooner or later it will destroy you.” Depeche Mode sell out stadiums wherever they go, year after year after year. Do you sometimes think about quitting the life on the road?